Haven't I been here before? Yes, just a few days ago. And ten times in the last three years. Not quite the time entrenched as I was in 2008-2009, when I spent 30 days in a 7-month period in Oklahoma. Louisville is a great city but we're stuck at an airport hotel, which is convenient to the football stadium but not to downtown and 4th Street Live. Thursday night's dinner was at the Cardinal Hall of Fame Cafe' which is a solid sports bar, and serves Bourbon Barrel Ale in frosty 22-ounce glasses. As noted in the past, this is a great sports town, home to Churchill Downs, Louisville Slugger, and the Muhammad Ali museum. It is also the home of some great college sports, headlined by the Preseason #2 Louisville Cardinals hoop team, who plays in the downtown Yum! Center, which is already a Top 5 NBA arena. 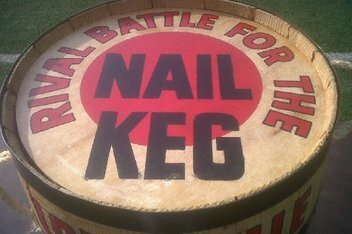 And the #16 football squad will be playing rival Cincinnati in a packed stadium tonight for the Keg Of Nails. And each team looks to get one step closer to the Big East's automatic BCS bid. The weather may be a factor with persistent rain, which may douse some of the fire that's been building over the outstanding quarterback matchup: Munchie Legaux vs Teddy Bridgewater. The Keg's been in Bearcat hands for four straight years, and tonight the Cardinals look to reclaim it.